Apparently, the new trend in Hobbiton is decorating your car for the holidays. In the parking lot at the grocery store this Christmas eve, I saw several cars sporting festive decorations. Two cars had stuffed reindeer antlers sprouting from the tops of their passenger side doors. One sedan had magnetic decals in the shape of Christmas lights on its trunk. And one Jeep had its doors and windows outlined with actual Christmas lights. Gotta find out where people are getting these things and get some for myself. 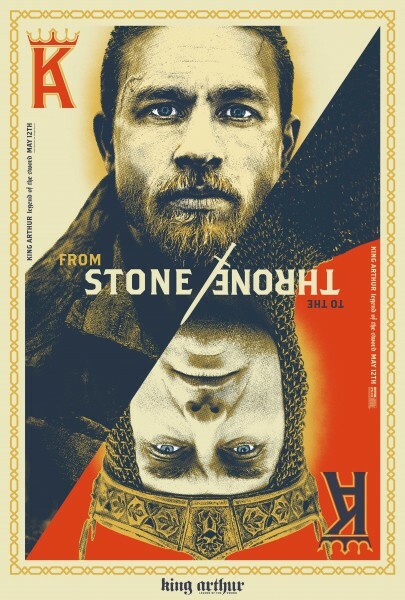 Shepherd Fairey’s poster for King Arthur: Legend of the Sword. I’ve watched (and read) any number of Arthurian stories so I was interested in seeing Guy Ritchie’s new movie, King Arthur: Legend of the Sword. First off, this movie wasn’t as bad as the reviews made it out to be. Think of it as an Arthurian action-adventure story and you’ve got the gist of the film. Ritchie takes a number of liberties with the familiar Arthurian legend. 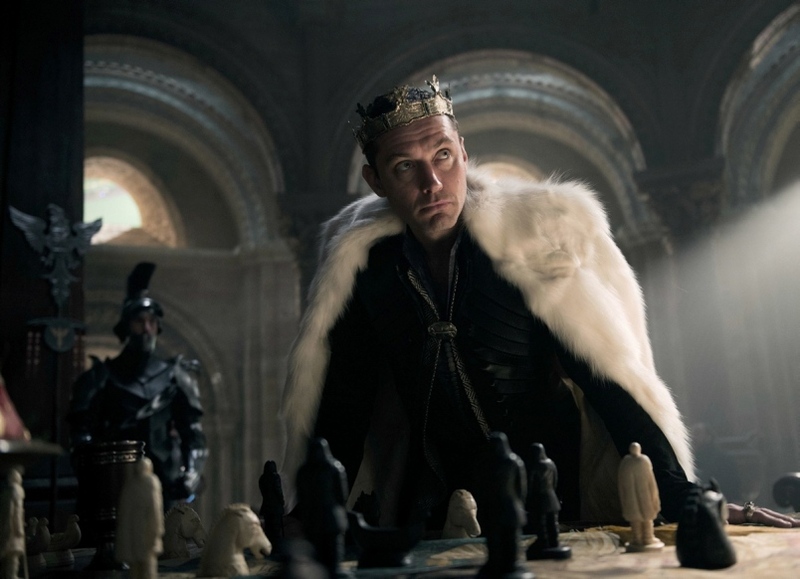 The main conflict is not between Arthur and his nephew, Mordred, but between Arthur and his wicked uncle, Vortigern, who has usurped the throne. There is a whole lot more magic–the sword Excalibur is a powerful magical weapon as opposed to being just a significant blade, the initial conflict that opens the film is between mages (magic-users) and non-magical humans, and Vortigern himself dabbles in sorcery. In other ways, Ritchie holds close to certain medieval tropes. The bond between Arthur and his lads reflects the Anglo-Saxon idea of fellowship between a leader and his picked band of fighting men. Arthur does pull the sword from the stone revealing himself as the rightful king only in this case the stone is the transmuted body of Uther Pendragon. 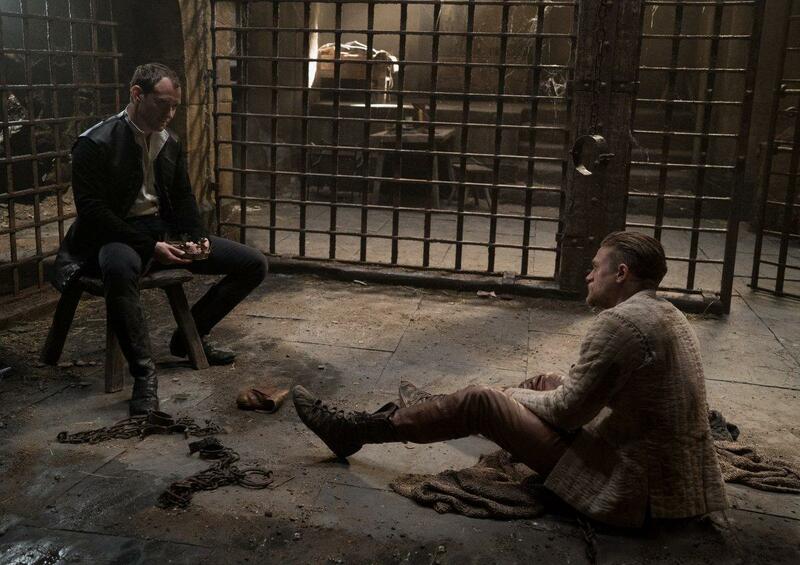 Vortigern (Jude Law) and Arthur (Charlie Hunnam) confront each other after Arthur pulls Excalibur from the stone. To recap the story, young Arthur is orphaned after Vortigern kills his parents and grows up in a Londinium brothel where he discovers that skills like pimping, con artistry, extortion, and street fighting are the perfect preparation for a career in politics. Vortigern, meanwhile, has spent the past 20 or so years building a large, phallic-shaped tower which when completed will make him the most powerful mage in the land as well as king. When Vortigern discovers that his brother’s son is still alive and in possession of Excalibur, Arthur suddenly finds himself on the run, dodging government troops, with a magical sword he can’t control, and a sudden change of career that he’s not sure he wants. The best thing about this movie, next to the epic soundtrack, is Jude Law. Some are to the manor born; Law was clearly born to look fabulous in a fur cloak while plotting evilly. The main flaw of the film is the lack of well-written female characters which was a problem in Ritche’s Sherlock flicks as well. To give you an idea, there are only two female characters with any major presence in this picture: one is The Mage (below) and the other are the Syrens, a trio of tentacled witches who hang out in the castle’s basement moat. Every other female character in this story is flat, underwritten, and apparently only exists to be window dressing or to perish horribly when the plot requires. Astrid Berges-Frisbey as the Mage. The Mage, who’s name we never learn, is absolutely critical to Arthur’s success, saving his life twice and helping him to learn to use Excalibur. Does she get a knighthood, a seat at the Round Table, or any kind of public thank you or acknowledgement from the guy she helped put on the throne? Oh, heck no. The Syrens–essentially Macbeth’s three witches with squid bodies–are consulted by Vortigern (pro tip: never accompany this guy to any body of water) and are critical to his rise to power. Again, we never learn their names and their fate at the end of the movie is unclear. Presumably, they’ve swum off to a new moat or lake. Personally, instead of watching powerful women help lesser men to the throne, I’d like to see a movie where the powerful women take the throne and the men play the helpmate roles.